In 2016, after John tested negative for the mutated huntingtin gene that causes the cruelest disease on the planet, Huntington’s disease (HD), I thought a lot about “WHAT IF“. “What If” I hadn’t found my way back to John? I would have lost so much and paid a heavy price. Guilt would have been tattooed on my heart forever for walking away from my soulmate, my true love, a man who had never hurt me. I would have felt ashamed for not being strong and I would never have known three wonderful women, my sisters-in-law, Lora, Marcia and Cindy. Also, I would have missed out on knowing the two most important people in my world today; our children Keith and Vanessa. My advice is to LISTEN TO YOUR HEART………. Watching Their Dance is John’s and my love story while living in the shadow of Huntington’s Disease. I share the tools I found in life to live happily, even with the losses we experienced, with this huge uncertainty looming over us. The themes of my book are mindfulness, forgiveness, hope and love. 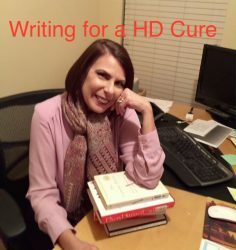 The huge uncertainty I chose to live with, John had an unknown gene status for Huntington’s disease (HD), the cruelest disease on the planet, caused a huge CHANGE in my life. His 50/50 chance of inheriting this rare, fatal, incurable brain disorder that is like having ALS, Parkinson’s and Alzheimers symptoms at the same time taught me to live in the moment, to live mindfully, which enriched my life. Through the years, my heart opened up to forgive more easily which lead to loving unconditionally. Even with the sadness John and I experienced, my three sisters-in-law died of complications from HD, made me appreciate and be grateful for everything I had in my life. “I was ecstatic that John and I were finally living under the same roof. Our split-level apartment had two bedrooms, one bathroom, a cute kitchen with a bay window that my coleuses loved. Upstairs was a dining area and a sunken living room with a stone fireplace; a sliding-glass door opened onto a little balcony that overlooked a creek. Finding your passion, and acting on it, I believe, is important to one’s happiness. Maybe it’s painting, writing, running, mentoring young people, teaching, helping the homeless, delivering meals to the elderly, volunteering for a your favorite charity, rescuing animals; anything that makes your heart and soul happy. Many of you may not know that Kate Miner, actress, musician, Huntington’s Disease (HD) Advocate has HD in her family. Her mother, and two sisters tested positive. Kate tested negative. What-is-HD? Last year, when I was publishing my book, Watching Their Dance, I reached out to Kate requesting a book jacket comment. She graciously agreed and her comment appears on the front cover. Kate and her husband are supporters of the HDSA FREEZE HD event that was held on Sept. 22, 2018 in Los Angeles. We Can Never Lose HOPE………………………. John and I have been connected to the Huntington’s Disease Society of America (HDSA), a nonprofit dedicated to improving the lives of anyone affected by Huntington’s disease (HD) for many years. Shana Verstegen with her mother who had HD.